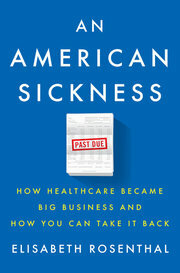 Jacob S. Hacker, Yale professor and author of many books and article critiquing the American political system, economy, and the fate of the poor and middle classes, reviewed a new book, AN AMERICAN SICKNESS: How Healthcare Became Big Business and How You Can Take It Back by Elisabeth Rosenthal (NY: Penguin Press, 2017). Most of the review takes up the question of why healthcare is not like other commodities and does not fit into the “let the market solve the problem” ideology of the last 40 years. If you are unpersuaded now, this is useful territory. Towards the end of the review Hacker turns to our developed country competitors’ approaches to healthcare. This is a great summary statement. Using a variety of tools and institutional arrangements every other government controls prices and healthcare budgets. They do not allow a one-sided market to focus on delivering as many procedures and prescriptions as possible without any systematic focus on health. 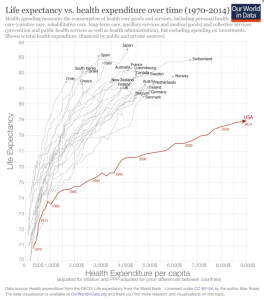 My criticism is that Hacker should have provided two further data points to put the outrage of American healthcare in its true global setting: US healthcare spending compared to other developed countries and health outcomes relative to other developed countries. As the chart below demonstrates, the US spends more than 25% more than our closest competitor, Switzerland, and twice as much as most including japan, France, Australia and Canada. The health outcomes are woeful. We rank 42 in the world for longevity and 56th for infant mortality. see https://www.cia.gov/library/publications/resources/the-world-factbook/ These facts need to be front and center in our thinking about healthcare. 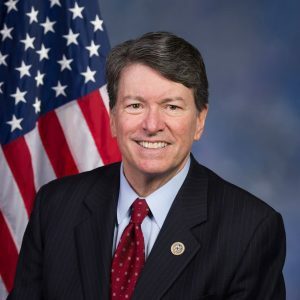 The developed world is filled with universal healthcare systems with many different structures and approaches, all with several decades of experience at delivering better healthcare at much less expense. The only question is how will poor and middle class people in the united states gain enough political power to end this great rip-off? ?